The video-games industry likes to think of itself as progressive but on the evidence of 2019 you’d suspect it was in the throes of a mid-life crisis. After the 24th, 15th and 13th instalments of Resident Evil, Kingdom Hearts and Far Cry; we await Mortal Kombat 11 , Tropico 6 and Crash Team Racing Nitro Fueled; a HD update of a 20 year-old kart racer from the publisher that parted ways with Destiny, the shooter that defined the generation. After the summer, the console release schedule turns to mist, where the certainty of a Call of Duty update is all that stands between the games industry sticking two PS Move controllers up its nose and crossing the Atlantic in a Nintendo Labo coracle. This lack of visibility around release schedules isn’t the existential funk that it first appears, however. As Google prepares to unveil its vision for gaming’s future, a new technology war is emerging from the shadows; ahead of a year of key announcements including PS5 , two new Xbox consoles codenamed Xbox Project Scarlett and… some likely curveballs. Away from the public gaze, this is a shadow war that has played out in boardrooms, engineering labs and marketing plans for years. A war with the potential to change the way we play and consume games forever. A war that goes beyond traditional console rivalries with the power to reshape the industry as we know it when Sony, Microsoft and Nintendo brush against tech giants Amazon, Apple and Google. A war that begins at GDC in San Francisco today. On March 19, 2019, at 10am PDT, we are all invited to gather round as the search engine giant reveals “Google’s vision for the future of gaming” . Google’s ‘console’ – which will most likely manifest as a gaming controller tied to a subscription service – will set the bar for next-gen cloud gaming i.e. games you play remotely via the internet like the fabled ‘Netflix for games’. Ambitions scale from a low-key service that runs indie titles to, more likely, a full-scale rival to AAA gaming consoles. Google’s GDC teaser video uses familiar, high fidelity, visuals from RPGs, racing games and shooter, so it’s safe to suggest the latter; with developers including Bethesda (Doom) and Ubisoft invited to its reveal event. Google recently trialled a cloud gaming service called ‘Project Stream’, where a select audience was invited to play Assassin’s Creed Origins on a Chrome Browser. Early feedback was highly positive , and this seems likely to form part of Google’s announcement later today. Google is far from alone in championing cloud gaming. Last week, Microsoft announced that Project xCloud would invite public trials this year, and showed off Forza Horizon 4 playing on an Android phone via an internet connection, with a standard Xbox controller attached via Bluetooth. Don’t forget: it’s possible to play any high end PC game on the internet right now using the – oddly under-reported – Shadow streaming service, which replicates the power of a $1500 PC using the cloud. We recently trialled the Shadow service as a permanent replacement for our desktop PC and came away highly impressed – including one eureka moment when we used the service for high-end video editing. Sony has PlayStation Now, which runs a huge back catalogue of classic PS3 games and select PS4 titles for $19.99 a month (or $99.99 a year). Tencent has Instant Play. Nvidia has GeForce Now. EA has announced a cloud gaming service called Project Atlas. In fact, Wikipedia lists 22 active cloud gaming services right now and that’s discounting services yet to be announced, or that have been halted. What’s obvious, is that *no-one* is signing up for 22 cloud gaming services, and we’re about to witness an almighty jostle for position. Flawless tech feels like the minimum bar (we can’t imagine much appetite for anything running slower than 1080p at a rock-solid 30fps), but those levels of performance are available now on relatively modest 15Mbps+ internet speeds (Shadow will run at 5Mbps, but that’s the minimum bar). The real battle will emerge around games (with a premium on exclusive games, extensive back catalogues, and cross platform play), services and user-experience (in the movies and TV parallel, Netflix has the best content, but also the most accessible and intelligent menus and recommendation tech) and – of course – price. A few years from now, we imagine there will be two or three dominant cloud gaming services, but even Google’s clout doesn’t guarantee it success if, say, Sony locks its best games to its systems. Of the competing cloud services, you can expect the usual closures, alliances and acquisitions, much how Sony bought the Gaikai cloud service in 2012 to create PS Now. Sure, Xbox One X is currently the world’s most powerful console, but that hasn’t stopped Microsoft supporting Xbox One S. Nor has PS4 Pro stopped Sony supporting PS4. With rumours abound that PS5 – or whatever it’s called – being backward compatible with PS4 Pro (or perhaps all PS4 games), traditional arguments about hardware power might start to feel moot. Who cares if you’re able to run a few games a few FPS faster with improved lighting effects, if *everyone* can get access to the same experience using cloud gaming? That’s not to say physical consoles are going away, at least not this generation, but we’re going to see the boxes act a lot more like iPhones, with multiple iterations in play; all running slightly improved versions of the same thing. Y’know: like a PC. There will, of course, be many people who fear performance issues around cloud gaming, or are unwilling accept to latency dips due to their net connection speeds. Until cloud gaming is the de facto delivery model, there will always be a gaming box; and it’s possible the hardware market will splinter even more dramatically between ‘entry level’ and ‘premium’ editions – like Xbox One S and Xbox One X. Think of it like the music streaming market: most casual listeners are happy with the quality of Spotify streams, but you’ll always find a dedicated enthusiast like musician Neil Young, who wants nothing less than lossless audio quality, even if he had to build the expensive (offline) Pono system to support it. For the record: Pono lasted two years until it was crushed by lack of support from major labels, and the cost. Young is now pursuing a higher quality streaming service option. That said, having a console that is easy to program for, which delivers great looking games, is easy to use, and *actually looks nice under the TV* won’t go out of fashion. The days of console manufacturers chasing bespoke processing chips, like Sony ill-feted (and expensive) Cell chip feel long gone. You’ll basically be choosing with configuration of trusted PC components you want under your preferred box logo. If hardware becomes less important, then a console’s choice of exclusive games become more critical than ever… although there is a ‘but’, which we’ll get to. Sony’s first-party exclusive AAA games – mostly solo-player experiences with lavish presentation and deeper narratives including God of War , Horizon Zero Dawn and Spider-Man PS4 – have outshone Microsoft’s exclusives during the current gen, with former stalwarts like Halo, Crackdown and Gears of War having lost their lustre. Microsoft has moved decisively to redress the balance, acquiring seven development studios in the last 12 months, including InXile Entertainment, Obsidian Entertainment, The Initiative, Undead Labs, Playground Games, Ninja Theory, and Compulsion Games, with Microsoft now owning a total of 13 internal studios. Sony has also shuffled its pack, ending deals with Quantic Dream ( Detroit: Become Human , Heavy Rain) and SuperMassive Games ( Until Dawn ). Sony still owns 15 studios , including jewels in the crown SIE Santa Monica, Guerrilla Games and Naughty Dog, with close ties to Hideo Kojima’s Kojima Productions, creators of Death Stranding . More gregarious recent rumours linked Sony with a move to buy Take-Two Interactive (raising the prospect of GTA 6 as a PS5 exclusive), but this was swiftly denied . Sony and Microsoft have both invested heavily with popular third-party games such as Destiny, FIFA, Battlefield, Assassin’s Creed and Call of Duty in order to claim their console offered the superior version of the game – a tactic which may only intensify. Nintendo’s role can’t be forgotten, with its enviable list of Switch exclusives including The Legend of Zelda, Mario, Smash Bros., Splatoon, Animal Crossing, and Pokemon. Disruptive recent rumours suggest Microsoft is looking to work with Nintendo, offering its Game Pass system on Switch consoles. With heavyweights such as Google, Amazon and Apple entering the field, it feels presumptive to assume the status quo of traditional console rivalries. 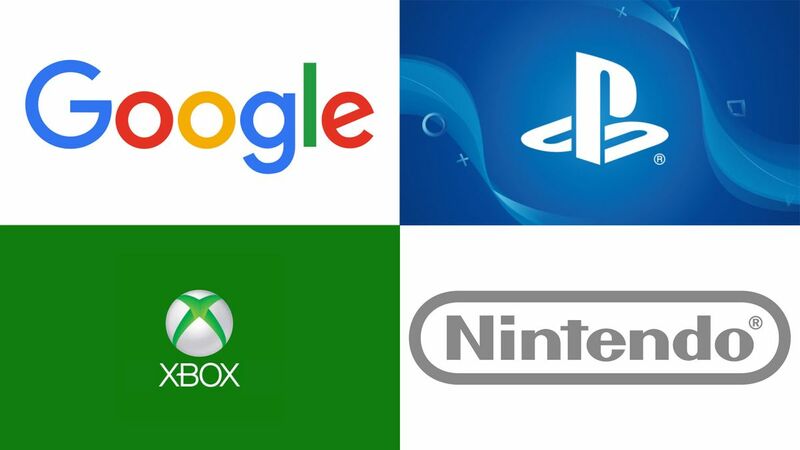 Might we see Nintendo / Microsoft / Sony forming alliances to combat a new threat? Perhaps not yet – but in the mid 1990s, it felt unthinkable that we’d ever see Mario and Sonic at the Olympic Games , such was the depth of Nintendo and Sega’s rivalry. 4) The battle for… services and ecosystems. It sounds desperately unsexy, but Microsoft has already made great strides in advancing Xbox as gaming’s premier ecosystem. The Adaptive Controller, Project xCloud, Microsoft Play Anywhere, inclusive gamer avatars, Xbox One Design Lab custom controllers, Game Pass; community features like Groups, Clubs and Arenas… the list goes on. Respected Microsoft commentator Paul Thurrot has been impressed by the company’s recent ambitions: “Microsoft has been following Netflix’s model all the way through and it is an understood model that everyone in the world understands, they are just bringing that model to gaming”. Quite how Sony or Nintendo respond – or don’t respond – will be instructive. Sony might double-down on its successful PS4 strategy: letting Microsoft do the hard work pioneering complex services and concepts, then position its console as a ‘no frills’ gaming machine (despite offering most of the same services as Microsoft). The climax of this was Sony’s famous E3 2013 ‘pre-owned games’ instruction video, which positioned the company as the gamer’s friend. In reality, rumours suggest Sony was tempted to adopt Microsoft’s position about controlling the exchange of pre-owned games (where the publishers see none of the profits), but was more adept at ‘reading the room’ when public sentiment turned nasty. You could argue that Jack Tretton’s E3 2013 ‘PS4 supports used games’ speech ‘won’ the PS4 vs Xbox One console war in a concise three-minute smackdown. Nintendo, equally, might be best-served ‘standing still’ – offering a family-friendly, box-ready, gaming console that promises to liberate you from complexity (although anyone who’s signed up for Nintendo’s Online service might disagree). Google brings an unrivalled suite of existing services, including Maps, YouTube, gmail and – of course – the Google search engine. What if Google refers every request to ‘play Far Cry 6’ to its own gaming service? Amazon has similar heft with its dominant online store, and ownership of streaming platform Twitch. With six major publishers, 22 live cloud gaming services and myriad ecosystem and customisation options, the ‘war’ won’t be won by complexity, but whoever can bundle this all up in a way that makes it sound like your life will get easier which, currently, Microsoft hasn’t achieved, despite putting the components in place. Hands up who’s actually read their PSN terms of service agreement? Each major publisher understands every element of our online gaming lives, and you can only speculate how this will be applied to cloud gaming networks hosting 1000s of games all competing for your attention – imagine the Netflix recommendation engine rigged up to Skynet. Even today, games like Far Cry New Dawn email you to ask where you’ve been or for your opinion on the game’s latest features. Where this gets interesting / scary is when a company like Google has the power to join this all up; using Gmail and your search history to offer up personalised gaming results. If you’ve ever received an email from Instagram passive aggressively asking if you’ve forgotten your login details, you can imagine where this will lead. In reverse, it’s an opportunity for a publisher to offer privacy as a selling point – or offline experiences as a retreat from our always-on lives. The end goal of cloud-streaming is, of course, to turn us all into subscribers. So an extremely affordable $5 a month for 1000s of classic games is, in fact, a lifetime value projection of $1800 per average 30-year-old customer. This is the model that subscription entertainment giants like Sky have operated for years, which raises the prospect of us signing up to multiple specialist gaming channels e.g. retro, shooter, RPGs, sports etc; or buying ‘high value’ bundle packs. Complexity and competition also opens the door to aggressive discounting; Sky, or BT, customers who don’t mind some polite haggling, can easily argue up to 50% off their annual bill – now imagine the same applied to gaming. For creators, streaming and unlimited access to (potentially) all of gaming history, raising a different question about the value of a game. Capcom has re-released Street Fighter on just about every gaming system in history – what does it mean for its profits when they all live on Google’s gaming cloud? This is a complex area, but we’d be wise to consider movements in the music industry, where smaller artists regularly complain about their microscopic royalties, with millions of listens required to earn a decent living. There are so many imponderables at play, but the days of paying $60 for a boxed game that you can trade to buy more used games, suddenly feels like an old world luxury / problem – depending on your perspective. This could spin into multiple articles, but TLDR; the battle for new experiences isn’t over. Sony continues to support PSVR, Facebook has yet to truly harness the power of Oculus Rift, and Nintendo is dabbling with accessible VR via Nintendo Labo . Pokemon Go’s phenomenal success is a reminder that the spoils are there for anyone who can uncomplicate the thrills of binding reality to the virtual. It isn’t a game (yet), but Google has just added AR prompts to its Maps. In a far more holistic sense, all arguments about next-gen hardware might be rendered moot by the advance of foldable phone screens, 5G and cloud gaming… but we’re likely 5-10 years away from that providing a true substitute for the home console. More sensibly, it will grow to become a complement, where you can take a seamless, cross-platform, experience anywhere you go. Sony ‘won’ last generation (read: sold more consoles) by keeping schtum, showing just enough of its hand to maintain buzz, then seizing on Microsoft’s botched attempt to blaze new ground. It might be tempted to follow the same PR / announcement strategy for PS5, but the real story will be around *when* it launches its console. Sony made a tactical error with PS3 (released Nov, 2006), which debuted almost a year after Microsoft’s Xbox 360 (Nov, 2005), then spent another six years playing catch up. PS4 and Xbox One launched within a week or two of each other in November, 2013. As things stand, rumours suggest Microsoft might have *two* new consoles ready for release by late 2019, with major announcements expected at E3 in June. Sony, meanwhile, has yet to officially confirm that PS5 exists, and it has dropped out of E3 entirely. It might be planning a surprise announcement event, much as they did with PS4 in New York at the PlayStation Meeting event on Feb 20, 2013. That date has already passed this year, and while you can’t rule out Sony trying to spoil Xbox’s E3 party by dropping an announcement in May / June, it feels exceedingly unlikely we’ll see PS5 this side of early 2020. That, or Sony watches Xbox’s E3 conference, then prepares a surgical counter-reveal in late summer. It used to be easier to pin announcements to physical calendar events, but the live-stream model now means most bets are off. It’s now possible to play some of the world’s biggest games, including Fortnite , Minecraft and Rocket League, with players on different formats – which almost felt unthinkable when this console generation began in 2013. Fortnite players can tackle their cross-format rivals on PS4, Xbox One, Nintendo Switch, PC and mobile (with some exceptions), and the arrival of cloud-gaming is only likely to accelerate this trend. Platforms might come to feel increasingly irrelevant, with players united by their love of the game, bound by a wider sets of services and community features. To extrapolate, it will be interesting to see if any of the traditional console manufacturers abandons their gated walls as a selling point, offering, say, access to Forza Horizon 7 via the Google, or PS5, cloud. It’s not really about being a liberal, ultra hippy, of course, but following the money. Why artificially limit your potential user base if your monetization strategy isn’t based on selling consoles or physical discs? Fortnite has been the most disruptive release in this aspect, a free-to-play game with almost unilateral cross-format play, which just happens to make a fortune via cosmetic microtransactions. Movies / TV and the music industry are living our future, where a handful of services have consolidated their market stranglehold. Spotify competes with Apple Music and Amazon Prime… but few are talking about Deezer, Pandora or Tidal. The ultimate destination is to own the market categorization, so your service (a noun) becomes a verb (a doing word). Will any gaming platform transcend to ‘Netflix and chill’? If the cloud becomes the default gaming medium, all competitors will want to default their way to victory – in effect, to become one of the two buttons on your TV remote, much how many modern sets offer one-tap access to Netflix or Amazon Prime. Beyond a certain point, it isn’t about having the best tech solution, but the easiest to use – and in our busy lives, anything that reduces the friction between impulse and deed is often the winner. Alexa: launch PS Now.